Hobbies: Chew the guts outta my stuffed toys & ripping cardboard into little pieces. Bio: I was 7 months old when my new owners came & got me one snowy night. I was tied by a short chain to my dog house & it was so cold outside. De loaded me up in a car in dads lap & we drove for miles & miles before we got to der house. De took me in de house & put me in a big kennel. I now a house dog & I so happy I warm when it cold & cool when it hot! Goals: My goals is to become a very good dog for Mom & Dad. Also to become an excellent tracker like my sis Sauci. Likes: Likes to go to kitchen wit Mom & watch her cook. Dislikes: I don’t like stayin in the outdoor kennel. Biggest Fear: Dat mom will leave. Bio: I was nearly a year old when my previous owners dumped me at a small town lake in de middle of December. 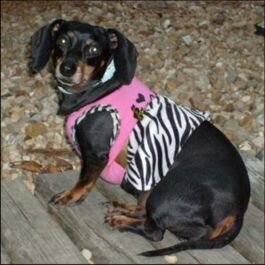 By de time sumbudy caught me I wuz skin N bones, dirty & cold (de say I looked like a little skeleton). Me lived in de woods by dis little lake for several weeks by myself. Then these nice people took me to my new home & I in heaven now! My mom loves my kisses & hugs she a Goddess to me. I can’t seem to press my face to hers close enough. My favorite time of day is when I can curl up in bed wit mom & dad. Me kisses em & kisses em & give them soulful looks of love! 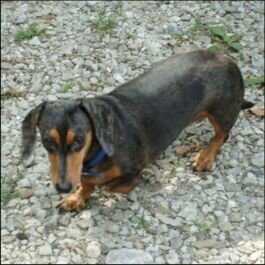 Dislikes: Annie the bloodhound buggin me when I am curled up in de covers. 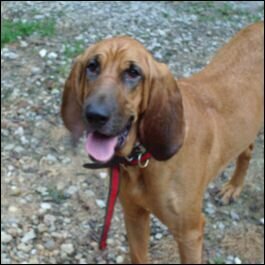 Follow this bloodhound & dachsund gang on twitter at @BloodhoundNdots. OMD Annie I didn’t know you were a chained dog before you met your mom…you poor thing…*nosekiss* so glad they got you! I love hotdogs and Whoppers too! I love Annie. She and jimnikricket and Ozzydox and MisterSnoop are my best pals on Twitter!! They make me laff and cry mostly laff tho!! They are the first friends I had on Twitter! They r my extended family! I am so sorry they had sad stories but now they have happy ones!!! Big licks my pals! !